Satellite image (top) shows the Borup Fiord Pass on Ellesmere Island in the Canadian Arctic. 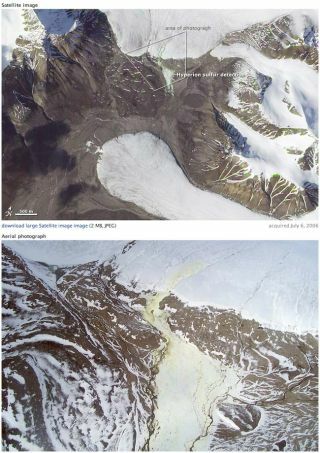 The bottom photo, taken by helicopter, reveals a sulfur stain almost surely caused by bacterial life. A sensor on the satellite working outside the realm of visible light was able to reach the same conclusion, providing a method for detecting life on this planet, or on another world, from an orbiting satellite. The images were released May 1, 2010. Full Story. If alien life is ever discovered,scientists expect it will most likely be of the simple, microbial variety. Andnow they've found some serious signs of such life, right here on Earth. And theclues and the methodology could help researchers find life on Jupiter's moonEuropa. In a pair of imagesreleased today -- one from NASA's EO-1 satellite and a closer one takenfrom a helicopter -- NASA researchers explained their examination of aglacier-carved valley that is like none other on Earth. The spot,high in the Canadian Arctic on Ellesmere Island, is called Borup Fiord Pass. Itis the only known place on our planet where sulfur from a natural spring isdeposited over ice. The sulfur leaves a pale yellow stain onthe ice, and scientists say it's a clear sign of biological activity. The sulfur stain, clearly visible in thehelicopter image, is not visible by regular satellite photography. But anothersensor on the satellite, called Hyperion, makes measurements in wavelengths oflight we can't see. Using this hyperspectral data from Hyperion scientists wereable to map the location of sulfur deposits. In effect, they've seen clearsigns of life from space. What they learn from all this may helpus find life elsewhere in the solar system, according to a statement from NASA. At the Borup Pass spring, hydrogensulfide gas in the water is converted to sulfur, the most common material inthe deposit, or gypsum. The process is complex, but it most often occurs whenmicrobes, such as bacteria, are present, scientists explained. On Jupiter'smoon Europa, scientists have found dark stains on the ice that have themwondering if they might be caused by a similar process. Europa is covered in ashell of water ice that's thought to hide an ocean of liquid water below.Liquid water is a key ingredient for life as we know it. Now NASA has measurements, from BorupPass pass, that the agency says could help researchers determine if the Europastains were created by life. "An orbiting sensor like Hyperioncould be used to identify chemicals in Europa's non-ice deposits that may be asign of extraterrestrial microbial life," NASA states.